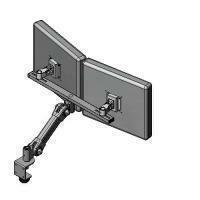 C-clamp mount adjustable dual LCD monitor arm(model #60210-2EC series) - Sallas Industrial Co., Ltd. This C-clamp adjustable dual LCD monitor mount is designed for mounting 2 LCD on one adjustable arm, and is small in size, light weight, of high quality appearance and competitively priced. The design incorporates effortless height, tilt and rotation adjustment of the monitor. Ruggedly constructed from light weight aluminum alloy arm parts with quality surface coating and provision for internal housing of monitor cabling. 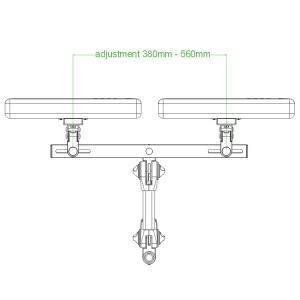 Standard C-Clamp for desk edge mount, wall mount and pole mount are also available for various configurations.